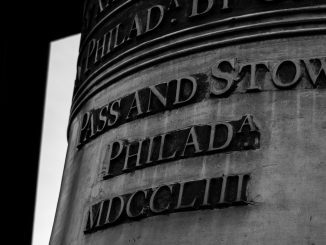 There are few landmarks so intimately tied to a city that it’s difficult to think of one without the other. 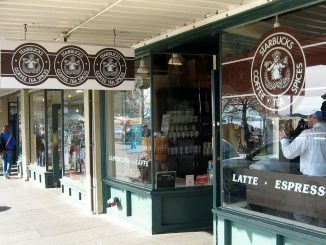 Among that list are the Golden Gate Bridge, The London Eye, the Statue of Liberty, and certainly the Seattle Space Needle. The Space Needle is an observation tower built for the 1962 World’s Fair. 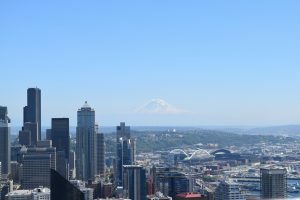 The top of the Space Needle reaches 605 ft. but the more common view is that from the observation tower at a still lofty 520 ft. Once the tallest structure west of the Mississippi River, the Space needle looks out over the city of Seattle, the Puget Sound, Mt. Rainier (on a clear day), and the Cascade Mountains far off to the west. During the 1962 World’s Fair, which drew more than 2.3 million guests nearly 20,000 of them took the elevator ride to the observation deck each day. What may be one of the most well-known landmarks is also home to a revolving restaurant. At the 520-foot observation deck you can sip some wine and watch as the horizon slowly passes the windows. 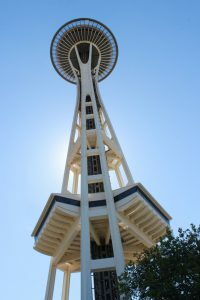 The earthquake stability of the Space Needle was ensured when a hole was dug 30ft (9.1 m) deep and 120ft (37 m) across, and 467 concrete trucks took one full day to fill it. The foundation weighs 5850 tons (including 250 tons of reinforcing steel). The structure is bolted to the foundation with 72 bolts, each one 30ft (9.1 m) long. Weighing in at 9,550 tons the Space Needle is heavier than many would think. This is because much of the weight of the tower is below ground and the center of gravity is only 5 feet above the base, meaning that if it were pushed over it would just about stand itself back up. It is this way because it was built to withstand winds up 200 miles per hour and to withstand earthquake up to 9.1 magnitude. The Space Needle also contains 25 lightning rods to prevent damage during the often rainy weather in the Pacific Northwest. The design for the Space Needle was a compromise the ideas of two men. Edward E. Carlson designed a giant balloon tethered to the grown and John Graham designed a flying saucer. The tower with a halo was the result. Victor Steinbrueck added the hourglass profile to the tower as a way to hold the two designs together and make them fit on the small footprint of property available for the construction. Another addition that was included in posters from 1962 was a spiral staircase leading to the elevator. Because of the tight building schedule this was omitted from the original structure. The stairway was added in the June 2000 remodel. The Legacy Light often called the Skybeam is an 85 million candela light which was unveiled on December 31, 1999 and shines a powerful beam straight up into the sky above the tower. While not light every night of the year, the Legacy light is illuminated to celebrate special occasions and national holidays. The original plan was the light would brighten the night sky above Seattle up to 75 days a year, but due to protests of light pollution, it is generally used fewer than a dozen times throughout the calendar year. On September 11, 2001, it was lit for 11 straight days in response to the attacks in New York. This light was based on an artist rendering of the tower used in a 1962 World’s Fair poster but the light was never included in any of the architectural drawings. 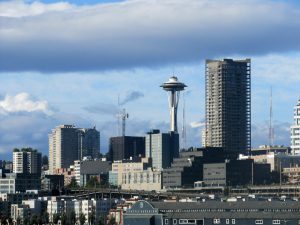 After more than 35 years gracing the Seattle skyline the city’s Landmark Preservation Board designated the Space Needle an historic landmark on April 19, 1999. The elevator travels at 10 miles per hour (4.5 m/s) and the trip takes 41 seconds. On windy days however, the elevators slow to a crawl of 5 miles per hour (2.2 m/s). The Space Needle was built to withstand wind speeds of 200 mph (322 km/h), double the requirements in the building code of 1962. The Space Needle can withstand Category 5 hurricane force winds. The top of the tower sways with the wind. It may move up to an inch in any direction per 10 mph (16mm per 10km/h) of wind speed. The original colors for the Needle were Orbital Olive for the body, Astronaut White for the legs, Re-entry Red for the saucer, and Galaxy Gold for the roof. 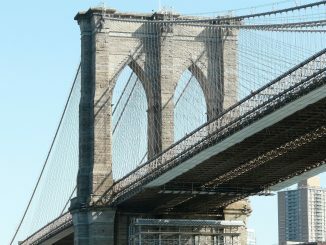 Total cost of completion for the project was $4.4 million (1962) dollars. 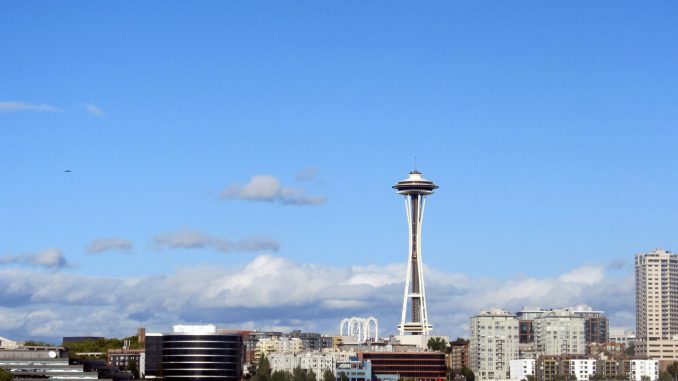 The first official cleaning of the Space Needle did not happen till 2005 and no detergents were used. Check out the Space Needle but don’t plan a trip around it. It’s a great site but will only take a few hours if you’re having lunch or dinner. Take the monorail. It’s a great transit system that unfortunately never got extended. There are only two stops. Don’t take an umbrella. It’s a sign to locals that you don’t live in Seattle since Seattleites don’t generally carry one. Go to the Pike Place Market. It’s one of the most historic farmer’s markets in the United States and has some great Seattle artists and local produce. It’s also a short walk from one of the two monorail stops. People in Seattle walk, a lot. Since many of the streets are steep, especially in downtown it may be too difficult if you’re not used to it. Don’t be afraid to take the bus. Lots of people ride the bus and it’s pretty common for locals, even those that have great cars, to take the bus just to avoid paying for parking.